In the same way Spotify has changed the way we listen to music and Netflix has changed the way we watch TV, Readly is here to shake up the way we read our favourite magazines. You pay a flat rate of £9.99 a month and Readly allows you to access a range of different magazines. The thing that makes the subscription so appealing is that, just like Spotify and Netflix, you’re not tied into a lengthy contract, it’s commitment-free and much more likely to hook you in than something that forces you to sign up for six months or even a year – after all, that’s why none of us are members of a gym, right? You can also access Readly across FIVE devices, meaning it’s great for families or those of us who are short of cash and like to share these subscription services amongst mates. There’s a huge selection of publications from the likes of Haymarket, IPC, DC Thomson and many more. At a quick glance you’ve got everything from trashy real-life women’s titles like Chat and Pick Me Up to much more specialist titles like Boat Owner and Amateur Photographer Magazine. I’m personally most excited about Time Out, Women’s Running and Wallpaper, as well as some of the US-based science titles, but there really is something for everyone. 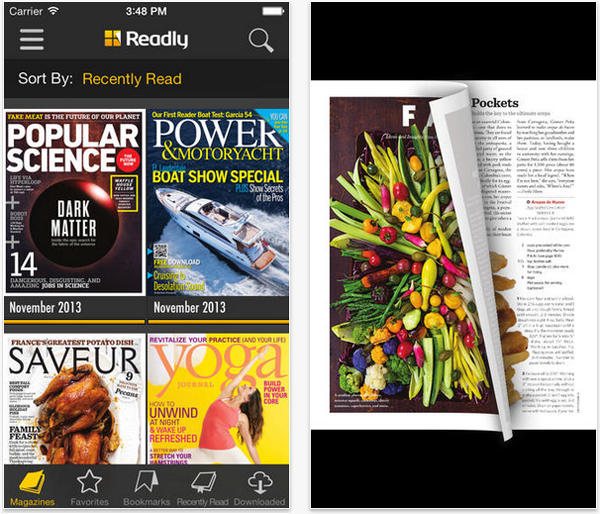 Already popular in the US and Scandinavia, Readly is available on most iOS, Windows 8, Android and Kindle Fire devices. Find out more here.